You don't have to give up a safe work environment for the sake of productivity. 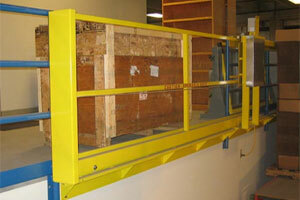 The Horizontal Sliding Mezzanine Pallet Gate is designed to be durable, productive, and provide the same protection as your railing systems. Designed to meet Federal OSHA requirements for standard railings, the gate is 42'' high with a mid-rail and a 4'' toeboard. 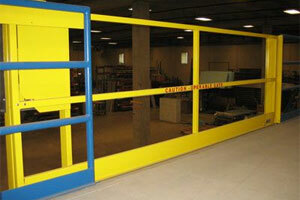 The gate simply slides via manual or automated operation. Our automated gates open with the push of a button or the pull of a cord. 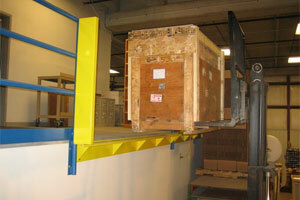 Once the material has been delivered to the mezzanine, the gate closes by a timer or another activation device. Electric gate models are available, equipped with standard features, such as safety to reverse on contact while closing and a timer to close with defeat. Additional options, such as amber warning lights, may also be added. Because each industry handles material of different sizes, the horizontal sliding mezzanine pallet gate is manufactured to your specific width requirements and offers options which will enhance the productivity and safety of your facility and employees.